The installation of BackWPup works just like any other WordPress plugin. You can install it via the WordPress backend or upload the files via FTP. How to activate your BackWPup Pro licence? First, get the BackWPup Pro zip file and download it to your computer. Log in to BackWPup.com with the credentials you got via email. In the upper right corner, click on My Account . You can find the plugin zip file in the API Downloads section. Download BackWPup Pro to your computer. 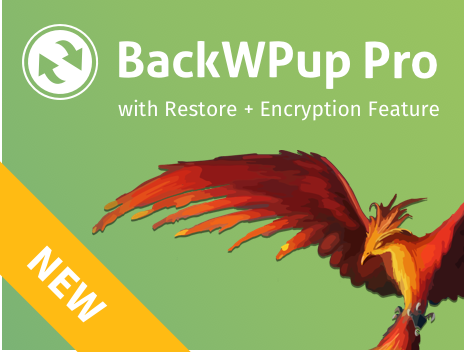 Important: If you want to upgrade the free version to BackWPup Pro, please have a look at our guide “How do I upgrade BackWPup Free to BackWPup Pro?“, so you don’t lose your plugin settings. Log in to your WordPress installation. Click the Upload Plugin button and upload the BackWPup Pro zip file from your computer. Click on Install now and wait until WordPress says the plugin was installed successfully. You can activate the plugin immediately with clicking on Activate now on the success page. If you want to activate it later, you can do so via Plugins → Installed Plugins. In section 2 we show you how to activate your BackWPup Pro licence. Do you have trouble installing BackWPup Pro via the WordPress admin area? Then try it via FTP. For this you need an FTP program, like Filezilla. Unzip the BackWPup Pro zip file on your computer. Upload the unzipped BackWPup Pro folder to the /wp-content/plugins folder of your WordPress. Log in to WordPress and activate BackWPup Pro via Plugins → Installed Plugins. In the BackWPup Pro admin menu you will find a menu item called BackWPup Pro API Key Activation. After clicking on this menu item, you will be redirected to the activation page, where you can enter your API Key and API Email. To get your licence data, please log in to your account on backwpup.com and visit the My Account page. API Key and API Email are listed on the My Account Dashboard.